As of now, there is no magic pill or bullet to cure narcolepsy, but below are several strategies to relieve some of the narcolepsy symptoms. Well before bedtime, be sure to avoid alcohol, tobacco and caffeinated drinks that could keep you from sleeping. Eat well in advance of bedtime and avoid large, heavy meals. Make sure exercise is at least three hours before bedtime. And recognize that very bright lights, even bright lights from your laptop or electronic device, can interfere with sleep onset. Try to make your pre-bedtime a relaxing one, take a warm bath if it helps you settle down. About bedtime, try to make a regular time for sleeping and waking up. The bedroom should be for sleeping, not TV, work or video games. Make sure it is quiet and dark. Clinicians at NY Metro Sleep may include medicines in the treatment of narcolepsy patients, but only after a complete assessment of your condition and symptoms. There are medicines designed to raise your alertness during the day and others to help you sleep at bedtime. But these must be balanced and carefully prescribed. In addition, the sleep team will need a full list of medications you take for other conditions because some of them may interfere with your sleep. The main risk factor for Obstructive Sleep Apnea is obesity, and one scientific paper estimates 70 percent of OSA sufferers are obese. It has been suggested that even a 10 percent weight loss can be enough to reduce or eliminate or reduce OSA events. Males have a much higher incidence of OSA than females, Other risk factors include being over the age 40 and having a large neck and small chin. Certain abnormalities in the structure of the head and chin also can predispose someone to OSA. And even the physical sleep position can contribute to the condition. Laying supine – on your back – can cause the tongue and soft palate to push backward and this pressure reduces the airway. - A screening involving a questionnaire and a physical examination that will include an evaluation of the upper airway. - Our board-certified sleep doctors will interpret and study the testing data in order to determine the most appropriate treatment. All findings will be reviewed with the patient in a confidential setting and, with agreement, treatment will begin. Obstructive Sleep Apnea has been troubling humans for centuries and even 19th-century author Charles Dickens was familiar enough to create a snoring character with what seems to be the disorder. But it wasn’t until 1980 that an Australian physician discovered that feeding positive air pressure through the nose of a OSA-troubled sleeper would eliminate the problem and allow uninterrupted sleep. From that discovery came the machine called CPAP, short for Continuous Positive Airway Pressure. The positive air pressure fed through a face mask worn by the sleeper exerts enough force to keep the upper airway structures and tissue (nasal cavity, sinuses, pharynx and sometimes the larynx) from relaxing so much that they block the airway and deprive the sleeper of oxygen. Our NY Metro Sleep team will order your CPAP machine and train you in its use. Once you take it home, we will be available to solve any problems you encounter or questions you raise. The CPAP machine has dramatically changed the sleep and lives of at least a million Americans since its invention. We are grateful for this important technology that is available to our appropriate patients. While CPAP machines are the most-commonly prescribed treatment for patients with Obstructive Sleep Apnea (OSA), there are times when CPAP is not prescribed, or when the prescribed CPAP treatment is not either effective or preferred by the patient. In such cases, our clinicians will sometimes prescribe the use of an oral appliance. There are several variations of custom appliances, including ones that move the lower jaw forward and others that stabilize the tongue, all designed to maintain an open airway for the sleeper. Advocates of oral appliances usually concede that they are rarely appropriate for severe OSA cases. Some oral appliance users favor them over CPAP because they are more convenient, especially during travel, and do not require electricity. While there has been an increase in the use of oral appliances, studies thus far find CPAP more effective overall. But when NY Metro Sleep clinicians do prescribe an oral appliance, we will be sure to follow-up with the patient to determine its effectiveness. Since obesity accounts for about 70 percent of Obstructive Sleep Apnea diagnoses, we at NY Metro Sleep take care to discuss with our patients the benefits associated with weight control as they move forward with their treatment. We also will suggest other behavioral changes such as avoidance of alcohol and muscle relaxants, both of which can contribute to the collapse of the airway structures that leads to apnea. One weight loss study of OSA patients reported by the federal government showed that of those participants who lost weight, 20 percent of them had a remission of their sleep apnea. Excess fat in the neck and tissue surrounding the upper airway structures can lead to the blockage of the airway during relaxed sleep. In our patient-first approach to treatment, we use our understanding of the patient’s mindset to create the best possible pathway to weight loss via behavioral changes. 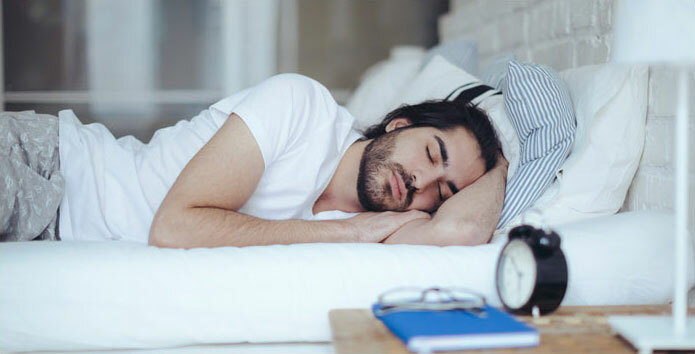 The role of sleep position in contributing to or discouraging Obstructive Sleep Apnea (OSA) is unquestioned among sleep experts. The unchallenged fact is that sleeping in the supine (on your back) position can play havoc with the airway of OSA patients, obstructing it in multiple locations. The problem is a matter both of physiology and gravity – the air structure and tissues of an OSA patient, especially an overweight one who is in relaxed sleep, simply collapse to an often-harmful degree. Recent studies have shown that lateral position (on your side) sleep improves airway anatomy and decreases the likelihood of a tissue collapse leading to apnea. Other studies have shown that OSA patients respond well when wearing a device that alerts them when they are in the supine position, which allows them to return to a more beneficial lateral position. Somewhat surprisingly, there been few studies aiming to determine the effect on OSA of sleeping in the prone (on the stomach) position. When it is determined that an alternate treatment for OSA is in order, the clinicians at NY Metro Sleep will carefully consider positional therapy as a possible treatment and, if appropriate, will provide the necessary training for our patients. Surgical approaches to eliminate or reduce Obstructive Sleep Apnea (OSA) have increased in recent years, practically all of them involving changes in the structure of different components of the upper airway -- the jaw, tongue, nasal passage, trachea, etc. For the most part, these surgeries were performed on patients who were unable to stick with the CPAP machine or who did not benefit from that most commonly effective device. Some[LA1] of these surgeries have had mixed reviews and no surgical approach promises to soon supplant CPAP as the dominant OSA therapy. One approach which reportedly has promise is maxillomandibular advancement surgery, a rearrangement that moves that the jaw and chin forward and expands the airway. One surgeon states that in these types of surgeries, there is an average 90 percent improvement in the patient’s AHI, or index measuring the severity of OSA. As always, your clinicians at NY Metro Sleep will consider all options when determining the best treatment for a patient’s OSA. Children in the pre-school ages of 2 to 6 may develop an aversion due to night-time anxiety and fears that typically spring from their active imaginations. (The classic "Monsters in the Closet" scenario.) Add to the mix the growing sense of independence of this age group and a chronic bedtime avoidance situation may develop. As children grow and begin to experience school environments and frequent social interactions, worries about issues from the child’s expanding world may trigger tactics designed to avoid bedtime and its "boogeymen." Furthermore, stimuli and stresses once introduced at adolescence – internet technology, organized sports and elaborate birthday parties, for example – have now emerged in the lower age groups and may trigger cascading thoughts and worries that interfere with sleep.